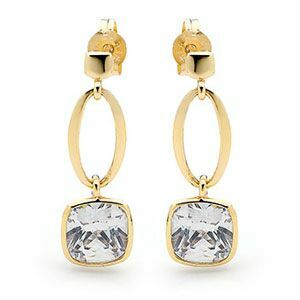 Fabulous 9ct gold drop earrings set with the most amazing bezel set cushion cut 7 x 7 mm clear cubic zirconia. Gemstone: 2 x cubic zirconia CZ cushion cut white 7x7 mm. Material: 1.9 x grams solid 9ct yellow gold. Material: solid 9ct yellow gold earring backs. Type: cubic zirconia CZ gold drop earrings.